Posted on April 4, 2011 by stephanie married. I don’t know why, but when shuffling through my files today, the items I most favored over the weekend were all kitchen accessories! I am not sure if it is because of all the new kitchen items I am looking forward to for our wedding, or just because I am in the mood to re-organize and re-decorate our sweet little apartment. 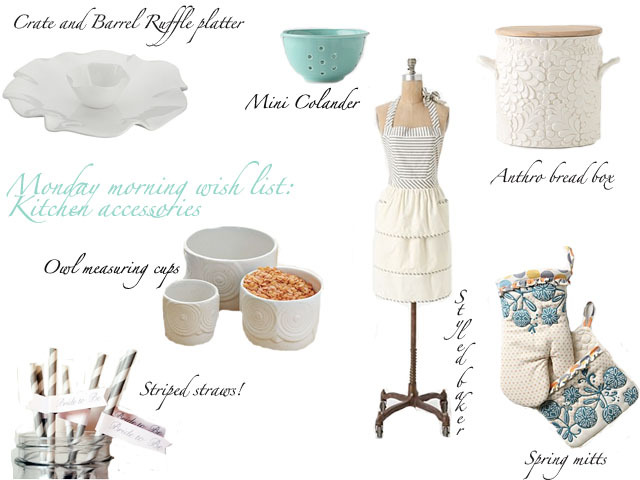 Either way, here is my Monday morning wish list: kitchen accessories style. Enjoy! Ruffle platter: If you couldn’t tell already, I am a sucker for anything with ruffles! Owl Measuring cups: So adorable! Would be cute to use for other purposes in the kitchen as well. Striped Straws: Theses are too cute. I also might be falling for them because of their “bride to be” flag, or because the proceeds from these items go to relief efforts in Japan. These come from Etsy! Apron: Anthropologie has a TON of cute aprons out there right now. This just so happens to be my favorite. Bread Box: Though a little on the pricey side, this bread box would be so cute on the counter top. Oven Mitts: These mitts give themselves a reason to stay out of the drawer.